Our forum offers a platform for technical issues, problems and hints as well as for questions in general and experiences regarding jukeboxes and accessories. Though it is mainly kept in German, we like to encourage you to place your post as well. Most user are able to read and answer in English. 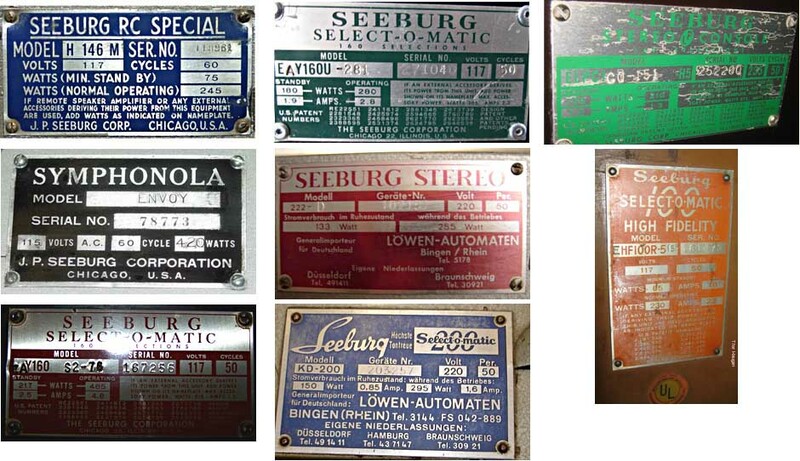 Join the forum for jukeboxes of various manufacturers like Wurlitzer, Seeburg, NSM, Rock-Ola, AMI, Rowe, Bergmann, Harting, Electro-Kicker resp. Jupiter, BAL-AMI, Wiegandt, Tonomat, Eltec, and others. Read, discuss, offer and get valuable tips and solutions or any answers to (your) questions. » Enter the forum Opens in a new window. You may read all posts without a registration but need to do so when answering a thread, post a new one, or want to get in touch with other members directly. 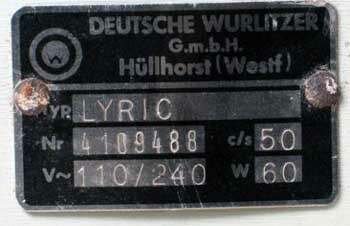 Note: It is most helpful to give the exact model type of your jukebox, not just a name like "Lyric" or "Seeburg 160". 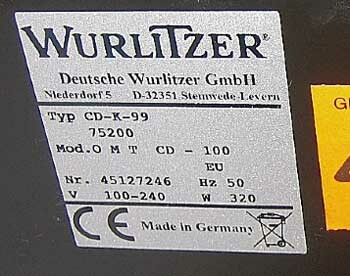 Usually the ID plate with model ID can be found on the back of your jukebox. Read as well "New Posts: Important and helpful to know" before placing your first post. The search-feature of the forum and the FAQ of the archive allow to look for similar problems to probably get a first help already. Posting in English is fine of course. 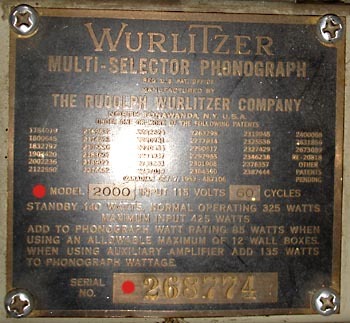 All jukeboxes, wallboxes and speakers got a model ID or model type by the manufacturer. This can usually be found on the ID plate on the back of the device, sometimes it's located inside. This ID can be a name, e.g. Prestige 120, Prestige 120 Bb, Prestige E120, Lyric, Vogue, Classic or a model type like 1468, 2000, or PAN 200. Usually this identifies a jukebox for sure. 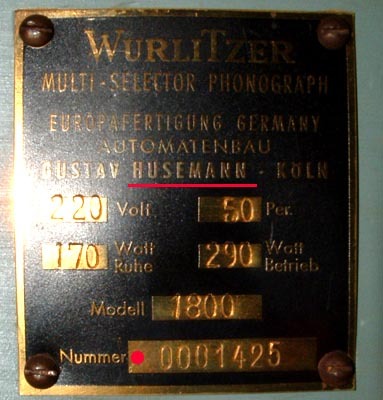 But with some jukeboxes this ID is not clear enough, e.g. Americana, Lyric, or OMT by the US and Deutsche Wurlitzer. They were built for many years and both the outside and the technical equipment might have changed within the years. 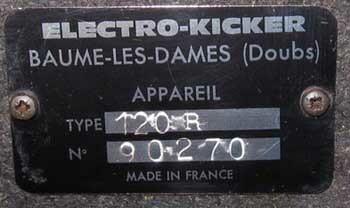 For these models the serial number can be helpful to identify year of production. Which details are needed to find the right schemati(s) and / or service manual? The exact model ID and probably the serial number will be important. Furthermore details regarding the installed devices like amplifier are helpful because they might have been changed within the years. Most units like amplifier, power supply, tormat, credit units, computer, etc. habe an own model ID. Also the information about the used cartridge can be helpful, e.g. with NSM. Which details are needed when posting questions in the Forum of Jukebox-World? In general same details should be given like mentioned before. In case there is no ID plate anymore, it can't be read, or still the model can't be identified, maybe the Jukebox-Archive (new window) with its visual summary of various models will be of help. Enjoy browsing around. 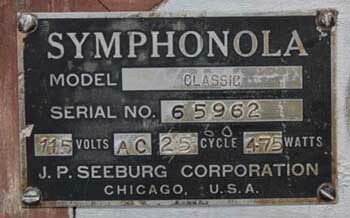 With many Seeburg models one can find one or even more prefix resp. suffix on the id plates. It should be noted that a suffix can have different meanings. 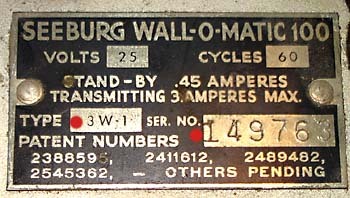 Ron Rich; USA: "ID tags applied to the outside rear of the cabinets varied. I have seen green, yellow, red, and for "domestic" use (inside the USA), blue."